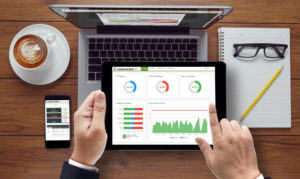 AgilQuest delivers trusted analytics on any size screen. Knowing how much office space you have and where it is allocated isn’t enough. Successfully managing your real estate means optimizing your space utilization. You need know how much space you’re actually using and, more importantly, how much you’re not using. AgilQuest’s Workplace Analytics platforms help organizations use data to get accurate, reliable answers to their top questions. Working hand-in-hand with transactional, right-now data gathered from our workplace management platforms, Forum or OnBoard, provides the information needed to support strategic business decisions. The measurement of the actual utilization of space is collected consistently, continuously, and systematically to produce a more accurate and less expensive data set than any other method. AgilQuest’s Analytics turns that raw data into valuable answers for corporate real estate executives, space planners, workplace strategists, facility management, and human resources strategists. Download a sample guide of some of the widgets and reports available to give you the powerful information you need.